The President of Shanghai Advanced Research Institute (SARI), Chinese Academy of Sciences, Dr. Songlin Feng and the Vice President of Micromeritics Instrument Corporation (MIC), Mr. Thomas Cook, recently signed a Memorandum of Understanding for the creation of a materials characterization demonstration and service laboratory. SARI is currently expanding their campus to promote advanced science and research. Micromeritics is proud to support the expansion with this agreement. The building that will house this 2000 square foot state-of-the-art laboratory is located on the SARI campus. Construction of the new laboratory will begin in the near future. Photo: From left - Jianzhou Liu, Deputy Director (SARI), Wenguo Qian, Director (SARI), Maohua Wang, Assistant to the President (SARI), Songlin Feng, President (SARI), Yuhan Sun, Vice President (SARI), Thomas Cook, Vice President (MIC), Ren Xu, General Manager (MIC), Shaun Pervis, Corp. Rep. (MIC), Tiejun Zhao, Deputy Director (SARI). 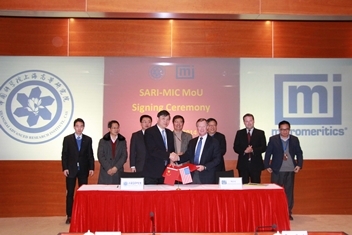 The signing ceremony was held at the SARI campus, Pudong New District, Shanghai, China, and attended by Dr. Yuhan Sun, Vice President, Dr. Tiejun Zhao, and other staff members and students of SARI, and Dr. Renliang Xu, China Business Manager and other MIC staff members. Founded in 1962, Micromeritics is a leading supplier of materials characterization analytical laboratory instrumentation and services. The company manufactures a broad line of automated laboratory instruments that measure physical characteristics of powders and solids for fundamental research, product development, quality assurance and control, production, and process control applications. Measurements obtained include particle size, surface area, pore volume, pore size and pore size distribution, material density, catalytic activity, and temperature-programmed reactions. Micromeritics’ Particulate Systems division features a line of materials characterization instruments that measure nano particle size, zeta potential, particle shape, high-pressure adsorption isotherms, dynamic vapor sorption, activity and selectivity of catalysts, surface energy, segregation testing, and determination of low levels of iron content in a variety of materials. The company also operates Micromeritics Analytical Services and Micromeritics Pharmaceutical Services, both providing contract sample analyses and consulting services.